Item is quite expensive for what it is and what it does. Easy to replace old unit with new control board. Easy to install the Wi-Fi unit. Best of all was the phone call to product support: the customer service rep took over the system remotely, did all the programming to manage a new Pentair Intelliflo VS pump, and helped me get going. Excellent customer support by the Zodiac/Jandy people. Five stars for the product, Five stars for the service. When my 10 year old Aqualink panel died, I wanted to upgrade to Jandy's latest technology. The IQ20-RS kit had all the bits I needed for a plug-and-play replacement. The folks at PoolCleaningParts had the kit off the shelf and into the mail the day I ordered it and my pool controller was restored, better than new, within a day. I especially like being able to control the pool from my phone. Overall, a great experience. Excellent product and even better customer service! iAquaLink 2.0 RS works as advertised and I couldn't be more pleased. I originally ordered the wrong product, but Pool Cleaning Parts accepted my return, discounted the restocking fee and had the correct part I needed out to me in no time. The kit was easy to install and connect to the internet. Took about an hour and 1/2 total. I can control my pool equipment from my cellphone, ipad and/or desktop. Exactly what my goal was. I hooked it up myself with no issues. Was easy to connect to the internet. Works just like it should. 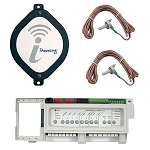 Great buy!, Best you can use to automize your pool and control it from any place with your smart phone. I have installed several and will continue using it. Q: What revision Is the board or IQ20-RS? Q: What is the firmware of the device?